…I have a running checklist in my head, looking for qualities or notes that remind me of other places I’ve been. Not so much in an originality sense check sort of way, but more so to bring a sense of familiarity to a place. It grounds me, giving me the feeling I’ve been here before, in this life or perhaps another. 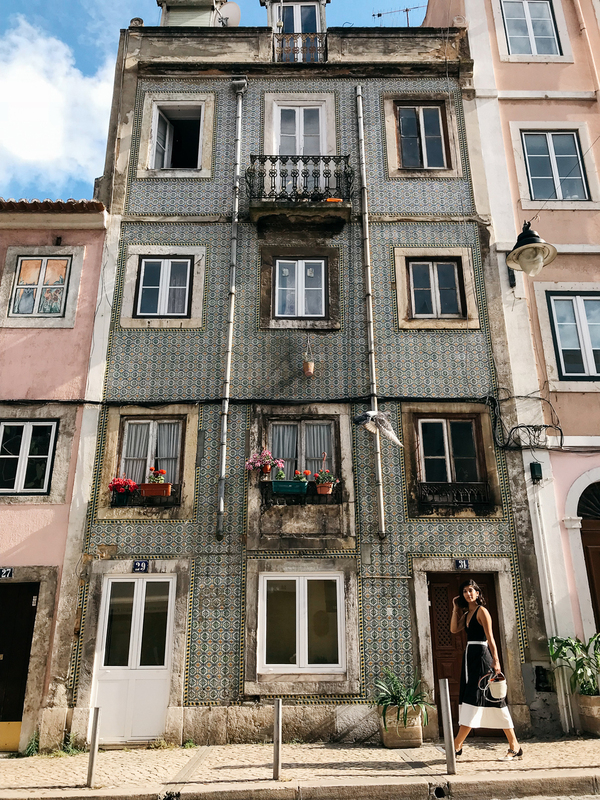 In fact, on several occasions, Heather tossed around the idea of renting an apartment of her own in Lisbon as a vacation home from her usual London flat. And if I’m being honest, I was more than tempted myself, if I happened to live on that side of the Atlantic. Long story short, we fell hard for Lisbon. And I think you guys will, too. So, enough gushing about the city. 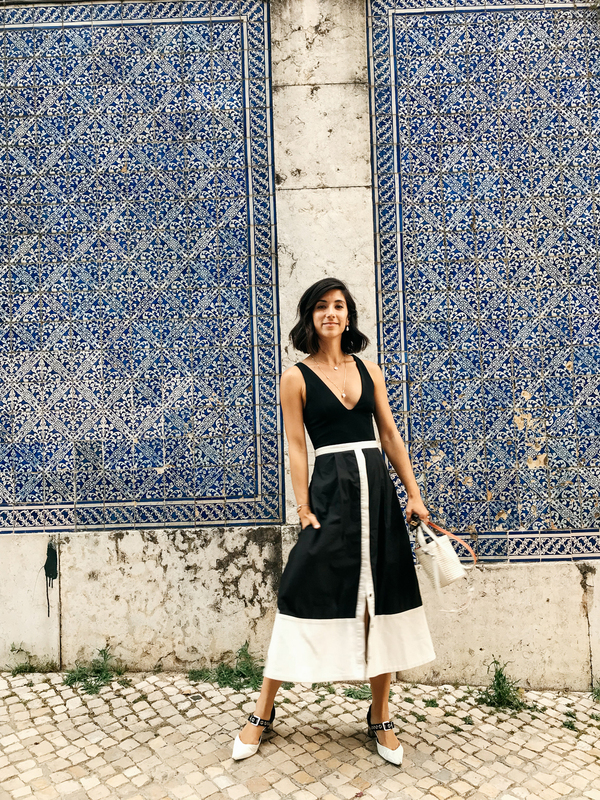 We had a little over 48 hours in Lisbon, so we had to hit the ground running! Here’s what we got up to! Shoes: Let’s get some packing housekeeping out of the way. For this leg of the trip, I packed two pairs of heels. And didn’t wear them once. Why? Simply put, you will fall if you wear anything over an inch. About 99% of the streets and sidewalks are cobblestone and not New York cobblestone, we’re talking weathered and worn, and almost slippery cobblestone. Couple that with an incline, and you’re bound to fall. Heather and I stuck to our flats for most of the trip and were amazed that any woman could manage heels in that city (to be honest, we didn’t see many). 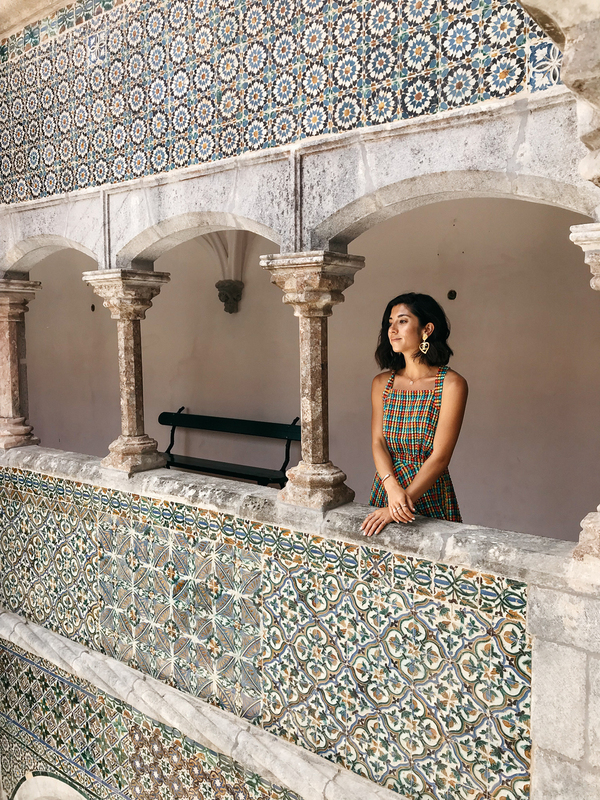 Speaking Portuguese: Since we both speak some conversational Spanish, there is plenty of Portuguese that sounds vaguely familiar. But I’ll admit, we both were pretty hopeless with pronouncing words with a Portuguese accent and not a Spanish one. 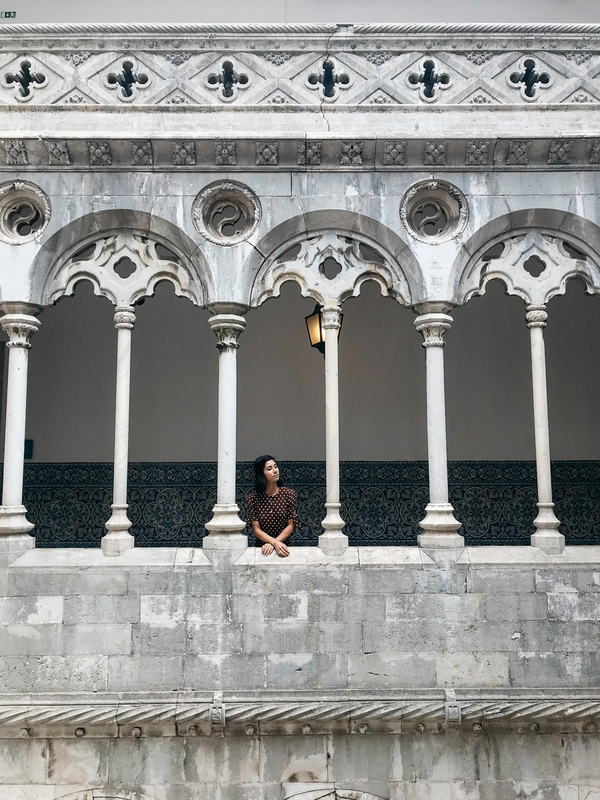 You’ll be relieved to know that Portuguese people are extremely kind and easy going and are usually happy to help you out, even if you’re butchering their language. Uber: When in doubt, we relied on Uber a few times and I’m happy to report, it was easy and relatively cheap. If you can, I highly encourage you guys to try to catch one of their famous trams rolling around the city if you can. We didn’t happen to, but hey, all the more reason to go back, right? 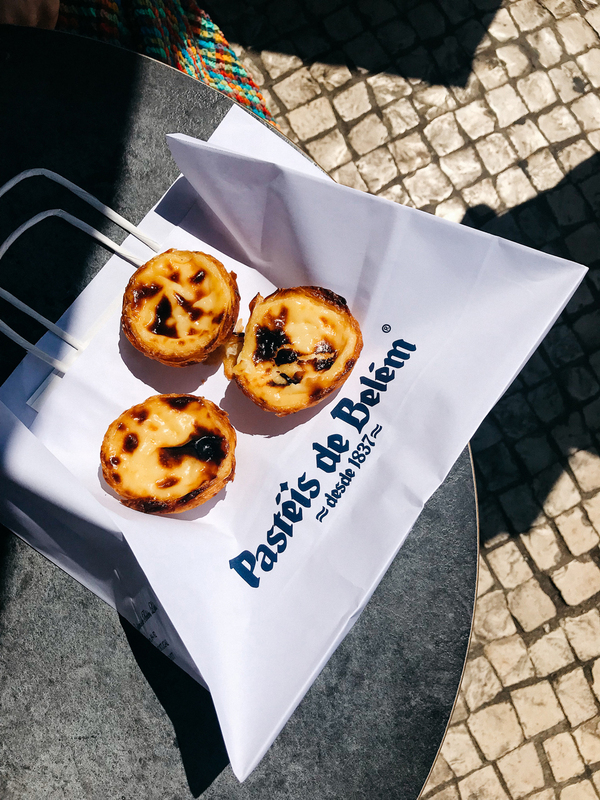 Pastéis de Belém: Let’s just get the obvious part out of the way and talk about natas. Oh my god, if there’s one thing I miss terribly about this trip, it’s our morning nata run. 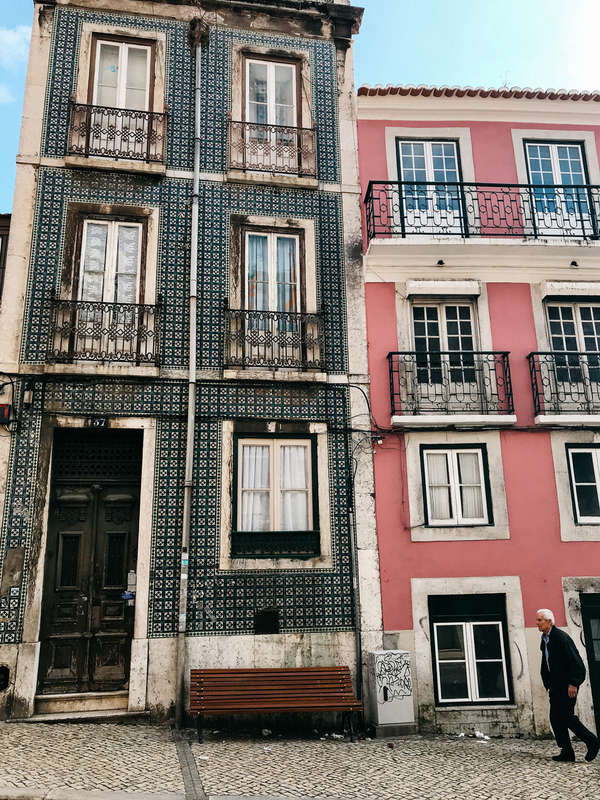 And if you happen to find yourself in Lisbon, do yourself a favor and snag one of these Portuguese egg tarts at their birth place, Pastéis de Belém, nestled in the, you guessed it, Belem neighborhood. Don’t get discouraged by the very long lines you’ll inevitably see outside — they move quickly and if you have your wits about you (i.e. don’t get trapped in large groups just taking photos and videos), you’ll be out with natas in hand. A Cevicheria: Full disclaimer here, we didn’t realize just how popular this recommendation was going to be — and man, getting a table here was TRICKY. So tricky in fact, we gave up waiting for a table and instead, headed around the corner to find O Asiatico, another concept kitchen from A Cevicheria’s lead chef, Kiko Martins. Another full disclaimer here, Heather and I, sadly, didn’t LOVE this spot. 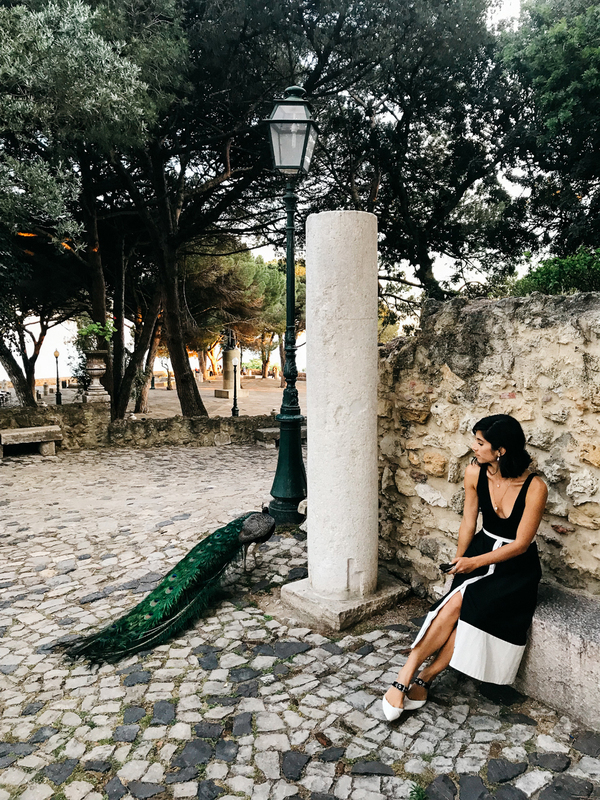 I think a lot of our disappointment stemmed from the fact we both were looking forward to more traditional Portuguese cuisine that evening and we were STARVING, so an Asian fusion lineup of small sharable tapas just missed the mark for us. That said, the ambiance was lovely and it did give us a chance to appreciate just how good looking Portuguese men are. 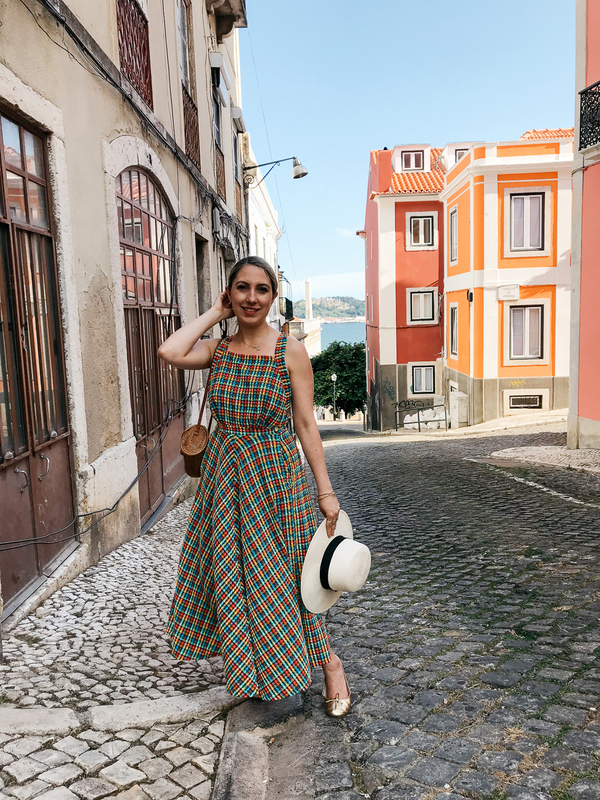 A Praça in LX Factory: We stopped here for lunch after exploring the Berardo Collection Museum nearby and it was delightful! We sat outside (the weather was just too lovely not to) and enjoyed some traditional fried Peixinhos da Horta (fried green beans), a few glasses of wine, salmon (for me) and octopus (for Heather). 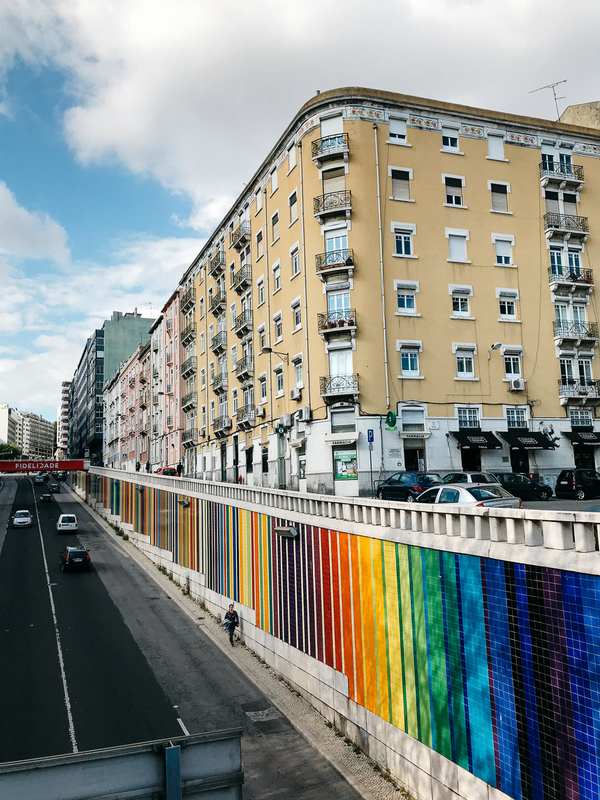 If you’re in Lisbon, I highly recommend putting LX Factory as a several hour day excursion — lots of shopping, art and restaurants to choose from! 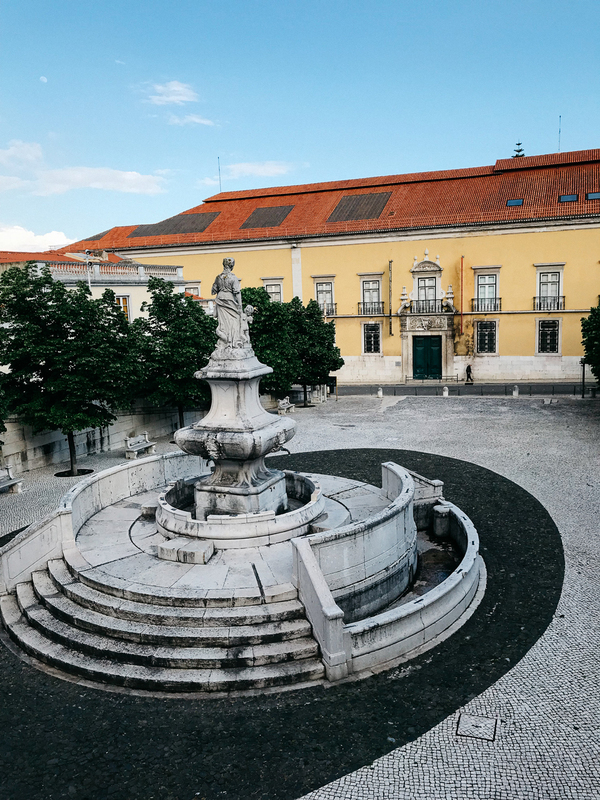 Palacio Chiado: Heather had read about this spot, mentioning that the owners had restored the former 18th century place from ruin into what is a beautiful, concept restaurant, featuring a number of different cuisines and bars between the two floors. Having read that the Portuguese are famous for their cod fish, I opted for the Bacalhau con Nata (cod fish with cream), at the recommendation of our waitress. Admittedly, I think I pictured a fish filet with some sort of cream sauce drizzled on top. What I received looked much more like a decadent mac and cheese platter — and I wasn’t upset about it. 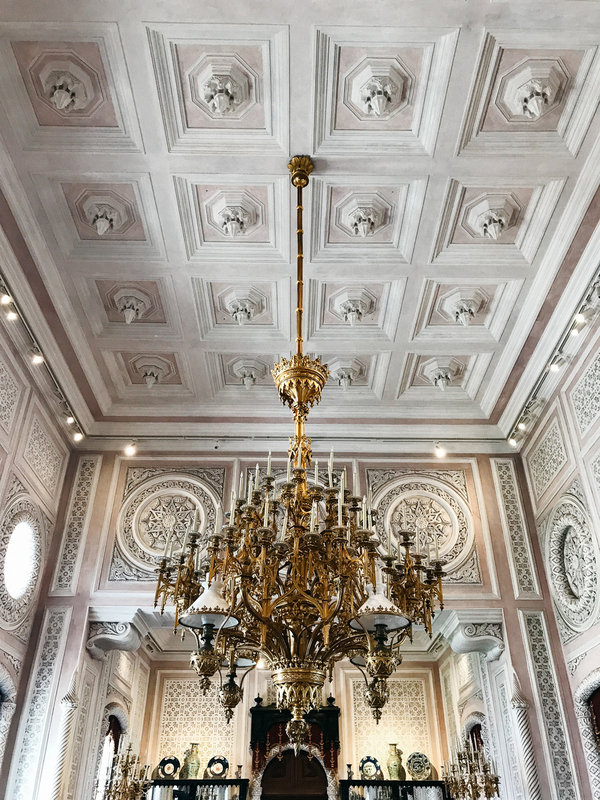 The decor here is beautiful — definitely worth a visit for the interior design alone! 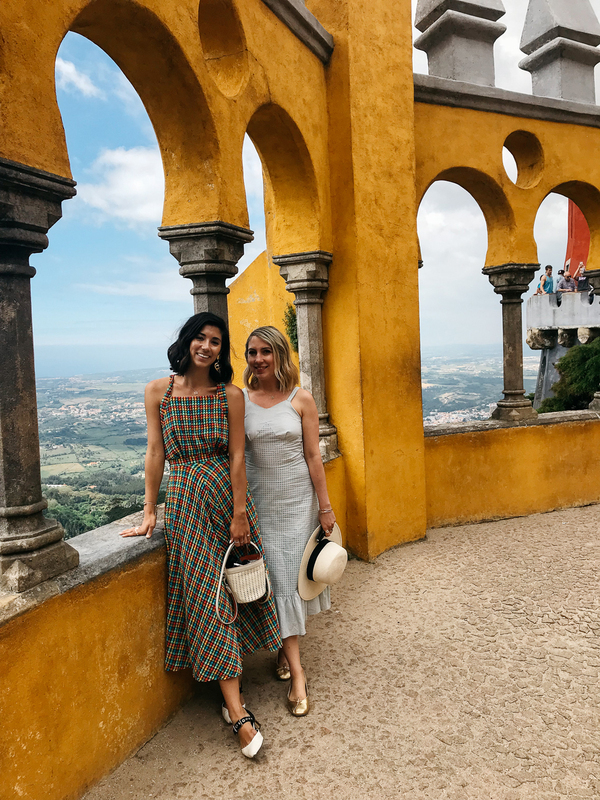 Tulhas (in Sintra): After exploring both Pena Palace and the Castle of the Moors for most of the afternoon, Heather and I were craving a big late lunch. 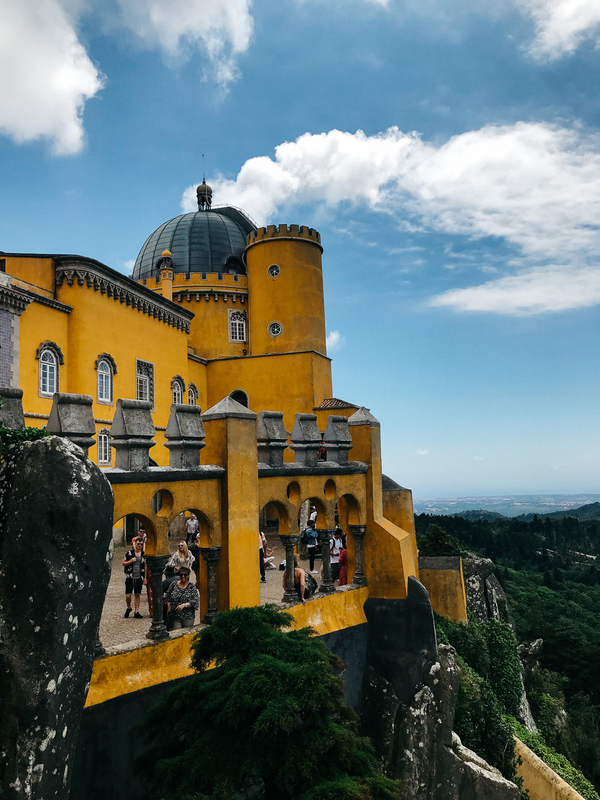 Thankfully, our tuk tuk driver, Pedro, recommended one of his favorite spots in Sintra, just down the mountain from Pena Palace. We popped into Tulhas and fell in love with the family restaurant vibe of it all — small, intimate dining room and a very friendly staff. We ordered the seafood rice special of the day and relaxed with a few glasses of wine, enjoying the locals passing around outside. 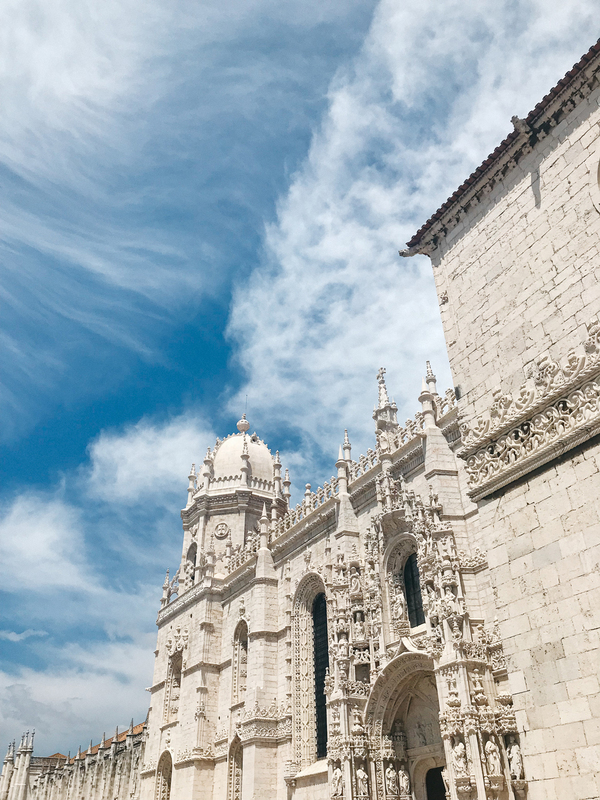 Jerónimos Monastery: Since we started off our first day in the Belem neighborhood, we did a lot of our major sightseeing and walking in this area. Starting first with a nata at Pastéis de Belém, followed by the breathtaking Jerónimos Monastery right next door. Also, if you keep heading toward the water, you’ll run into the Tower of Belem. 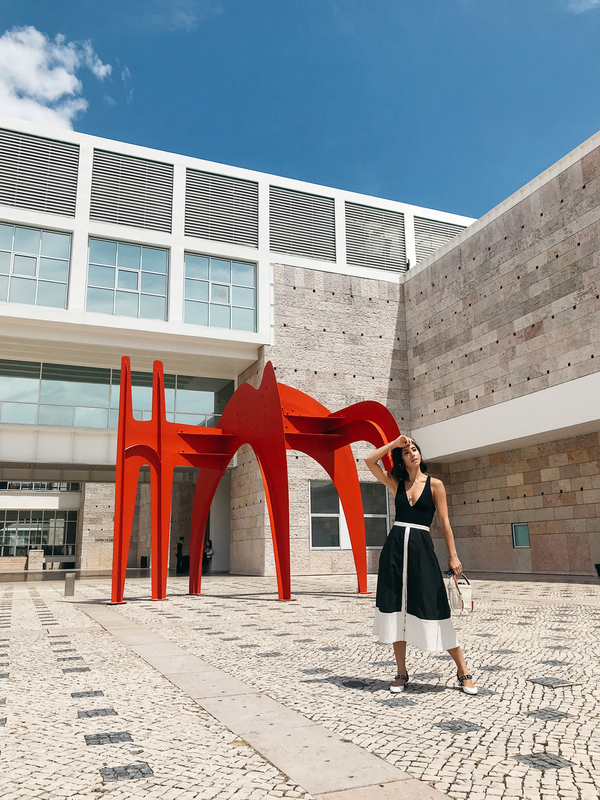 Berado Collection Museum: If you keep heading down from the Monastery, you’ll inevitably run into the Berardo Collection Museum, a stunning space housing modern and contemporary art by the likes of Warhol, Picasso, Dali and Duchamp, to name a few. Heather and I hopped over here right before lunch and loved the emphasis on Portuguese contemporary artists. Admission is free, too (they just ask for a couple euro donation at the door). LX Factory: Keeping with the Belem theme here (I told you we over indexed on this neighborhood), we hopped over to the much hyped LX Factory and let me just say for the record, the hype here was worth it. Set as an open market, LX Factory is a well executed retail meets art meets cuisine mini neighborhood — many of the vendor spaces are set up in renovated warehouses, with plenty of mural art and live music to go around. Definitely give yourself a few hours here to shop around and grab lunch. And while you’re there, make sure to pop into Ler Devegar — bookstore Instagram heaven. Give yourself time to just WALK! 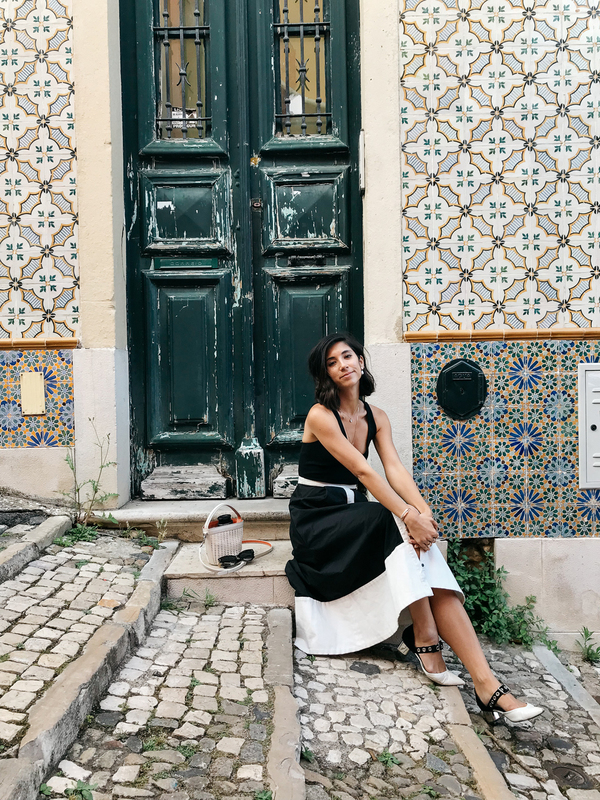 Like many European cities, Lisbon is best enjoyed by foot. 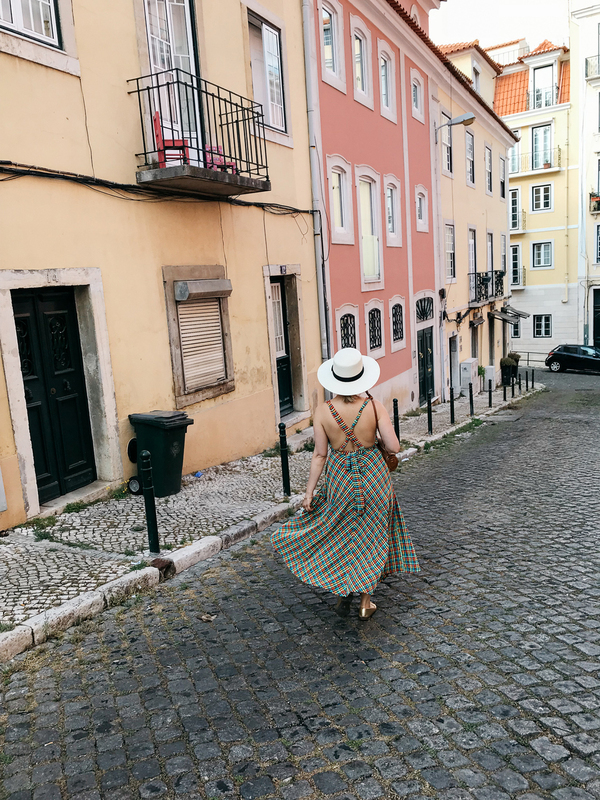 The joys of stumbling upon beautiful winding streets and tiled buildings are that much easier to be had when you’re walking around and popping your head around corners, “just to see what the street up there looks like.” Plus, since Lisbon is situated across many rolling hills, you’ll have plenty of views (and yes, hikes up a hill) in your future. 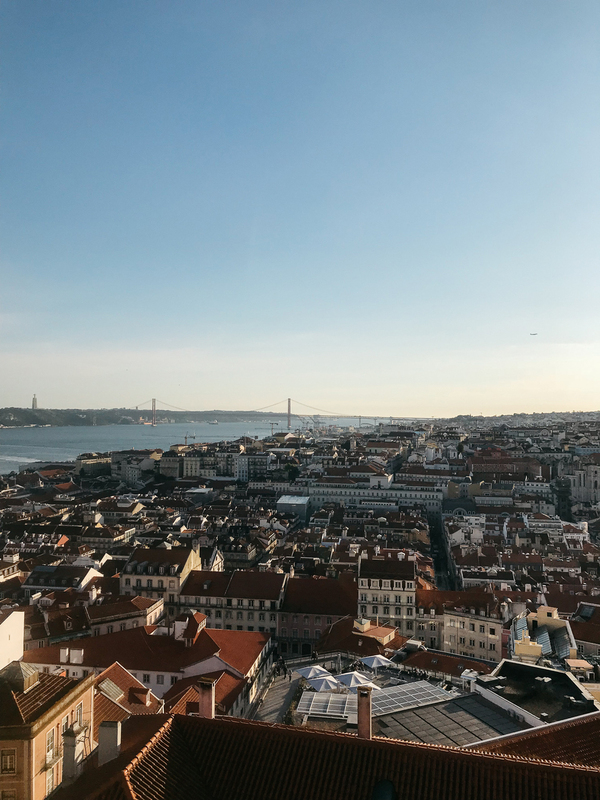 We had planned out our day to spend most of the morning and afternoon in Belem, before walking over to the São Jorge Castle (about a 40 minute walk), which boasts one of the best views of the entire city, especially at sunset. Along the way, we made sure to give ourselves time to just “get lost” and appreciate all the adorable narrow streets and homes. 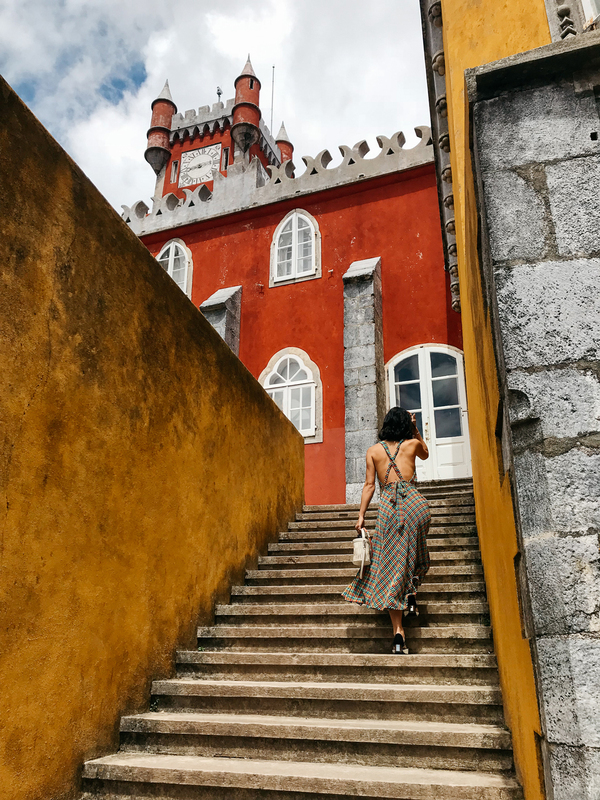 Once you get closer to the São Jorge Castle, you’ll enter the Alfama neighborhood, the oldest district of Lisbon, where the streets become even more narrow and winding and confusing! Lots of great photo opps around here! 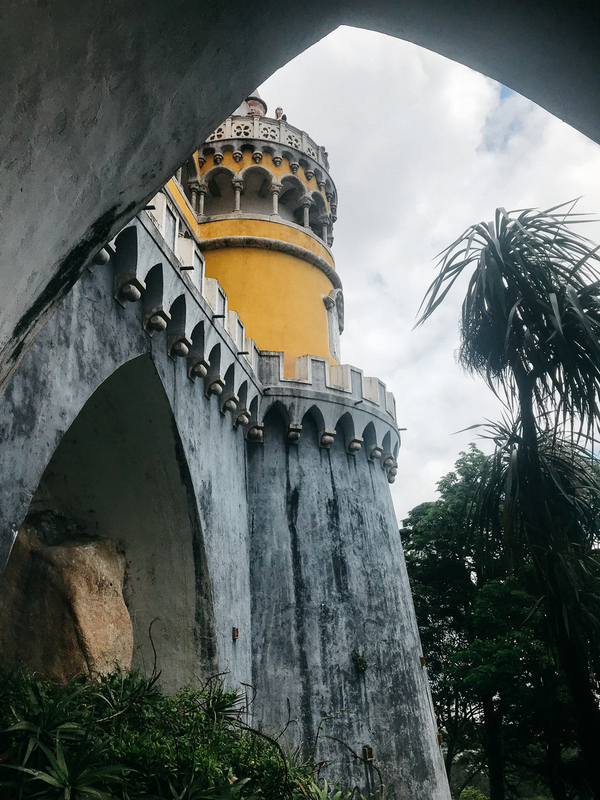 Day trip out to Sintra: Our second full day in Lisbon, we decided to take a day trip out to Sintra, mainly to tour around Pena Palace and the Castle of the Moors (although there are plenty more castles and historic chalets to visit out here). 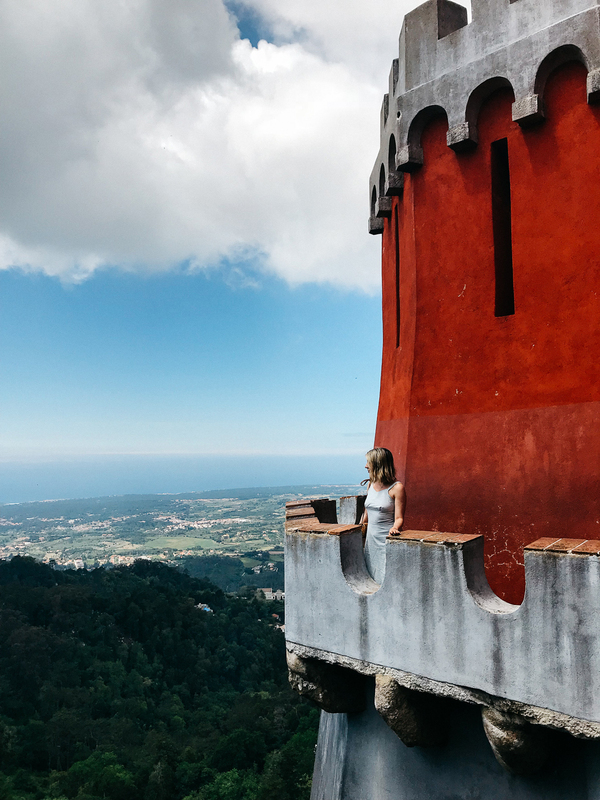 Sintra itself is only about a 40 minute car drive outside Lisbon — we opted to take an Uber out there, which totaled out to be 20 euro — pretty cheap! 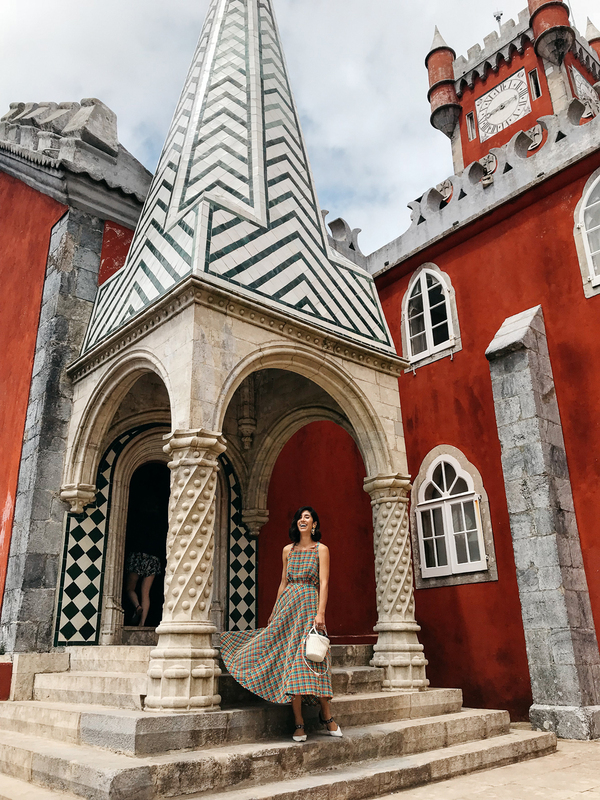 Pena Palace, as you may have seen from some of my Instagram posts, is a technicolor dream castle and is definitely worth the trip, It’s nestled at the top of a hill, overlooking the town of Sintra, boasting of Romantic, Medieval, German and Islamic architectural notes. Of course, if you’re there, definitely tour the inside, as the interiors are just as dramatic. 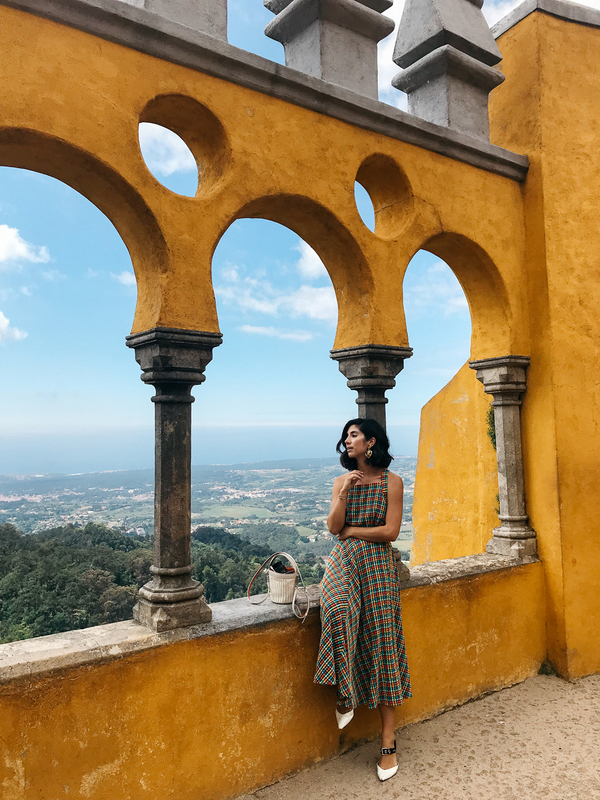 From Pena Palace, we hopped over (via a tuk tuk driver) to the Castle of the Moors, a 9th century castle that sits like a fortress alongside the cliff of an opposing mountain facing Pena Palace. 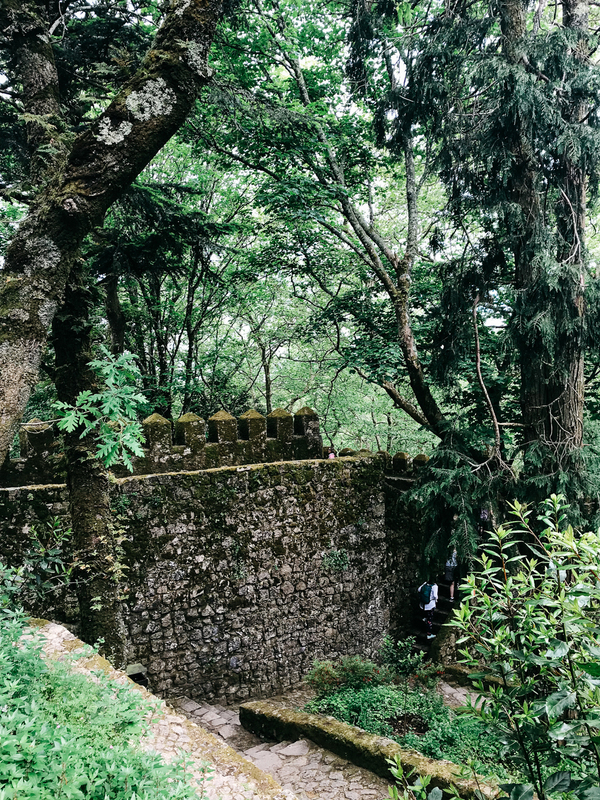 Much of this castle is beautifully overgrown with moss and other greenery — making it feel that much older and ancient. The views here are incredible, as well. 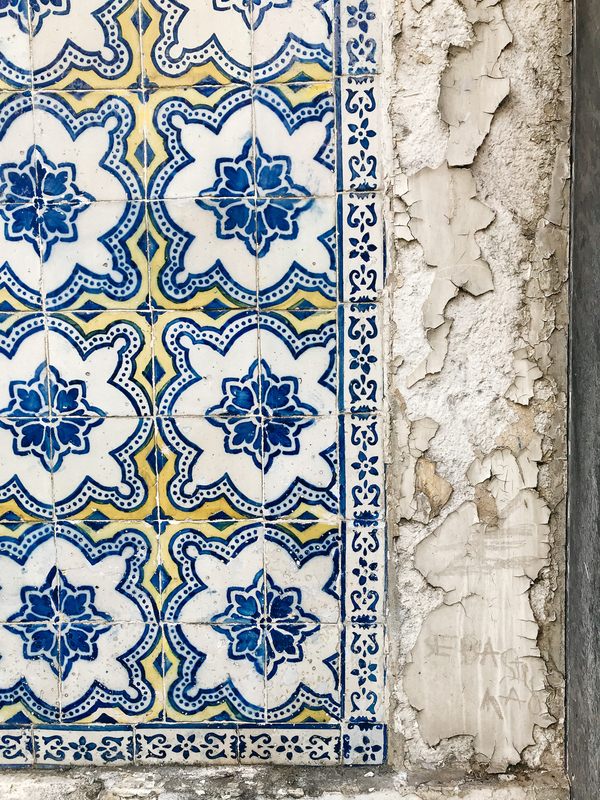 Museo Nacional do Azulejo: Our last morning in Lisbon was short (we were flying out early that afternoon), so we made it count with a visit to the Museo Nacional do Azulejo — a beautiful tribute to Portuguese tile work in a former 16th century convent. 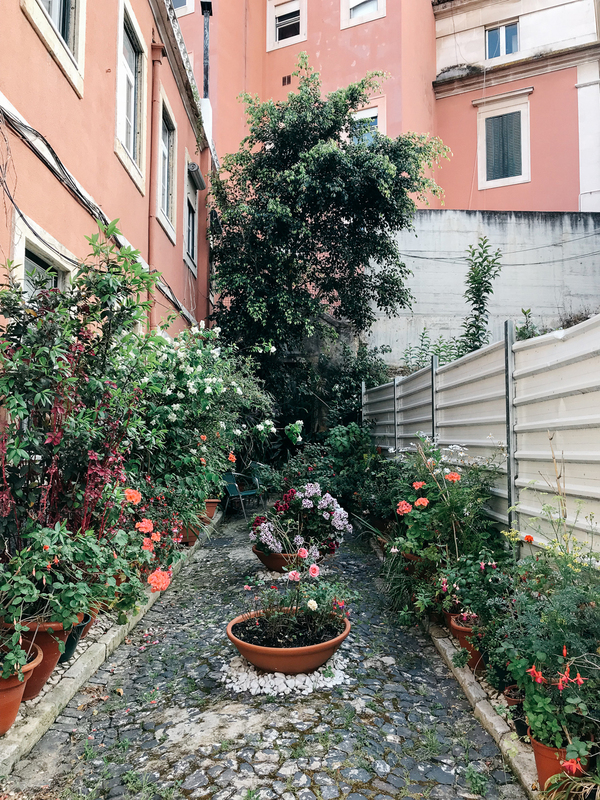 The more often I travel, the more often I want to check AirBnB first, especially in a city like Lisbon that just feels so, well, easy to live in! 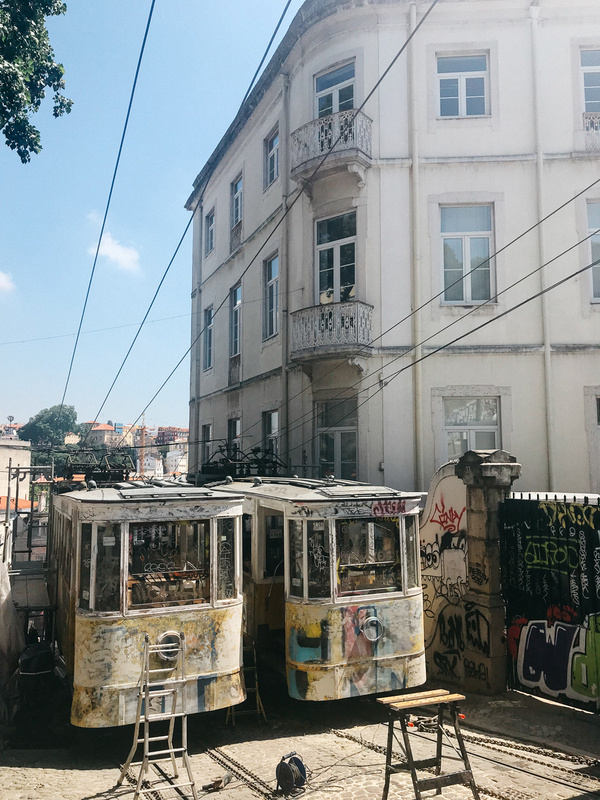 We stayed at an AirBnB in the heart of the Príncipe Real district (basically where A Cevicheria is located) and it’s definitely a lively, cool kids neighborhood situated at the top of one of the many major hills. I can’t seem to locate the link to our exact AirBnB at the moment, but once I do, I’ll update this post! 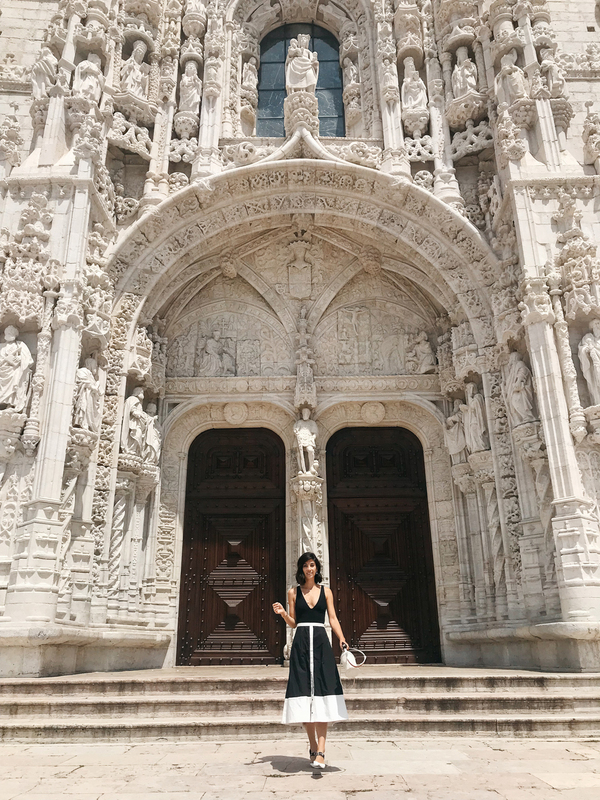 Travel and 48 hours in, europe, lisbon, portgual, travel, travel guide. 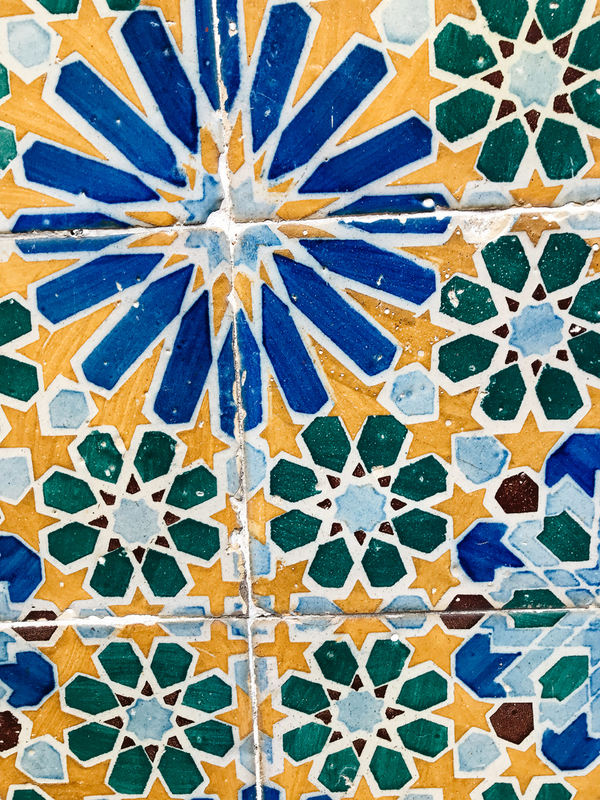 The architecture, patterns, and colors are wondrous. Thank YOU for the thoughtful commentary on Lisbon. I am going there this fall on a tour. I think almost all of your visits are included in my tour. I am very excited! Also, it’s good to know about the shoes! LOVE the lined black dress! You always are SO fashionable! Wow! So classy and gorgeous! Such a historic place to visit. 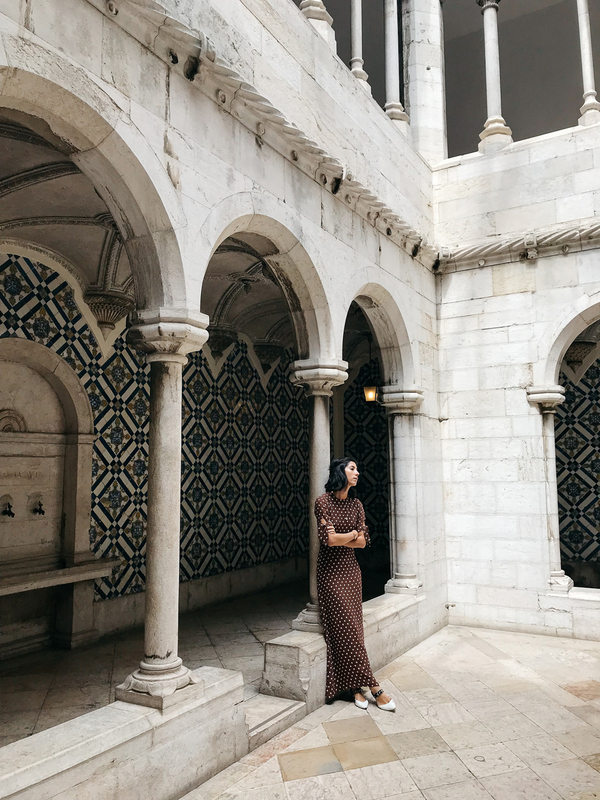 Lisbon is one of my top priorities when i go back to Europe! great photos and tips, duly noted to only wear flats there! So glad you loved it!! I can’t wait to go back and add in the Azores! 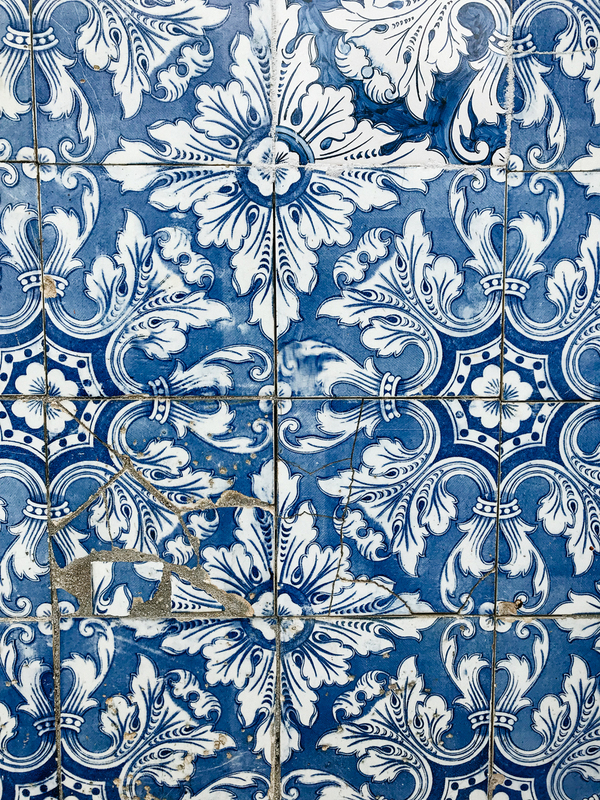 I’ve been to Lisbon…oh..those beautiful times. The small guide is perfect and I couldn’t be more in love with your outfit! Going to Lisbon in a couple of weeks so definitely saving this! May I ask where you found the tuktuk to get between the two castles in Sintra (were they just stationed outside perhaps)? And completely smitten with all your outfits here! You’re going to love it!! As far as the tuktuks go, they’re actually everywhere, most will sit out in front of Pena Palace and all other main castle/chalets in the area. 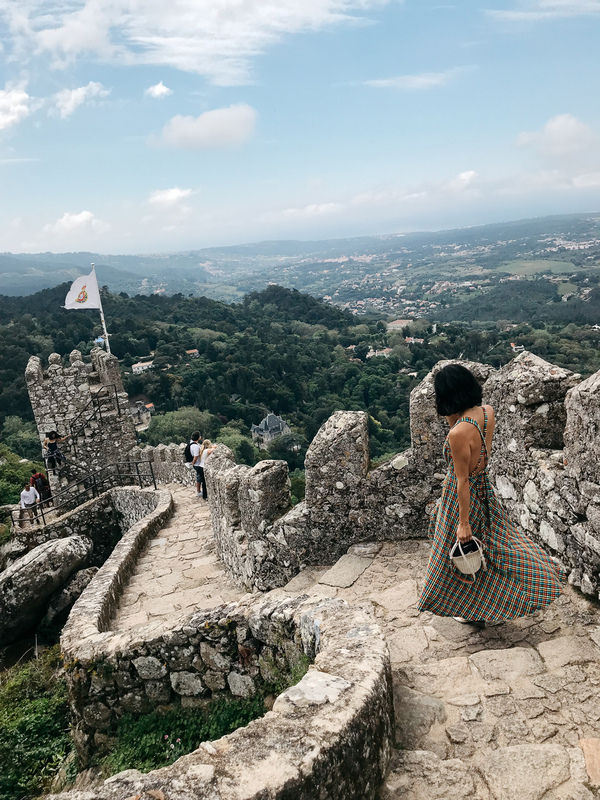 He charged us 5 euro each and actually took us back down the mountain into Sintra so we could grab lunch and eventually get our Uber back to Lisbon.